Protest against the regime of Al-Assad. Aleppo, Syria. 2013. 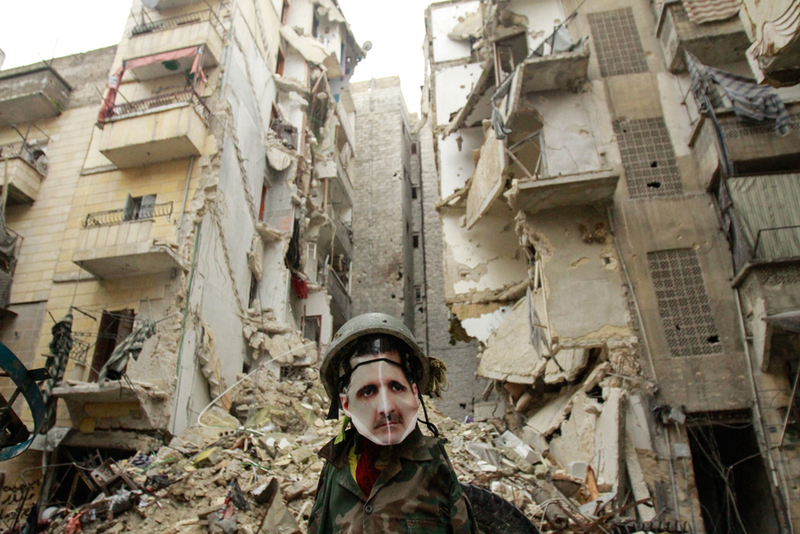 A dummy with a picture of Bashar Al-Assad is used to distract snipers in Salahadinne frontline. Aleppo, Syria. 2013. Rebel fighters during combats near the international airport of Aleppo, Syria. 2013. Rebel fighters run across the frontline in the district of Bustan Al-Qsar- Aleppo, Syria. 2013. Rebel fighters prepare to begin an operation near the international airport of Aleppo, Syria. 2013. A rebel fighter is seen in the frontline of Bustan Al-Qsar. Aleppo, Syria. 2013. A rebel fighter walks through the destroyed buildings of the Bustan Al Qsar frontline. Aleppo, Syria. 2013. Rebel fighters heat themselves in the frontline of Izaa district. Aleppo, Syria. 2013. 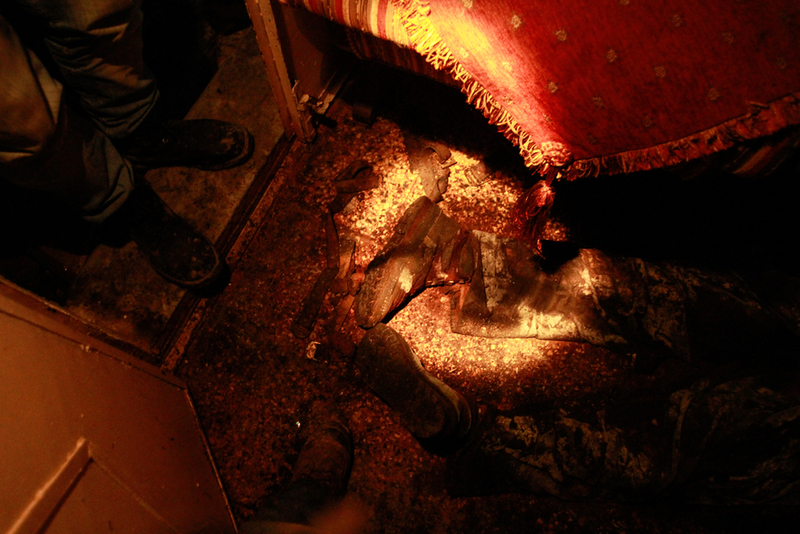 The body of a man is seen inside his house after heavy shelling. Aleppo. Syria, 2013. A man cuts wood that will be used for heat in the cold winter. Aleppo, Syria. 2013. A family sits around a fire in the Hanano district of Aleppo, due to the lack of fuel and electricity, civilians use wood from doors, trees to heat themselves in the winter. Aleppo, Syria. 2012. Frontline near the international airport of Aleppo, Syria. 2103. A member of the civil defense runs to the rescue truck, after a jet fighter strikes in the vicinity of the civil defense center in Aleppo, Syria. 2014. 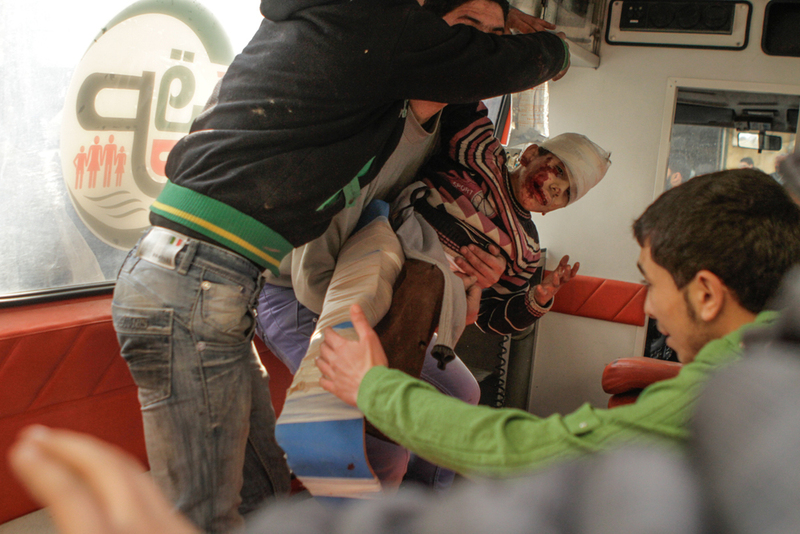 An injured child is transported in an ambulance after an airstrike of forces loyal to Al-Assad. Aleppo, Syria. 2013. A family that lives in the frontline of Salahadinne is visited by rebel fighters who ask them to leave for security reasons, they will stay until the father will return after being detained by forces loyal to Al-Assad. Aleppo, Syria. 2013. Civilians make line for distribution of food in Hanano. Aleppo, Syria. 2013. In rebel held Aleppo, clandestine school work despite the fear of bombings. Aleppo, Syria. 2013. Civilians try to rescue people trapped in a house after an air strike. Aleppo, Syria. 2013. Rebel fighters run across sniper alley. Aleppo, Syria. 2013. Civilians of different factions attend to the Friday rallies in rebel held Aleppo, Syria. 2013. 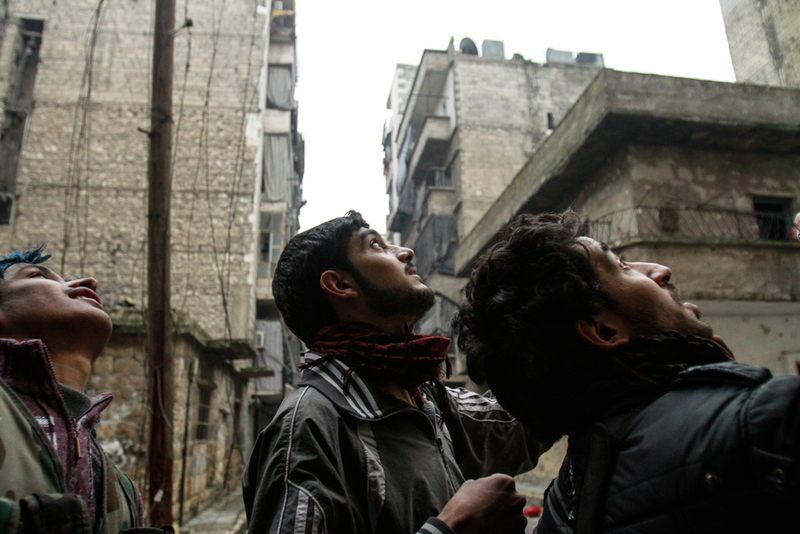 Rebel fighters patrol the destroyed Souk in Aleppo, Syria. 2013. Rebel fighter look to the sky at the sound of a jet fighter. Aleppo, Syria. 2013. Rebel fighters heat themselves in a house used as a base. Aleppo, Syria. 2013. Rebel fighters during a combat operation in the vecinity of the International Airport of Aleppo, Syria. 2013. A suspected "shabiha" is detained by rebel fighters near the international airport of Aleppo, Syria. 2013. A rebel fighter is seen in the frontline of Salahadinne. Aleppo. Syria. 2013. A suspected "Shabiha" is detained and blindfolded in combats near the international airport of Aleppo, Syria. 2013. A rebel fighter walks around destroyed buildings in Aleppo old Souk market. Aleppo, Syria. 2013. Rebel fighters gather to eat dinner in the frontline of Salahadinne. Aleppo, Syria. 2013. The commander of the rebel group in the Izaa frontline walks in the arms and munitions deposit. Aleppo, Syria. 2013. The Izaa commander holds his daughter who lives near the frontline. Aleppo, Syria. 2013. Rebel fighters walk near the Salahadinne frontline. Aleppo, Syria. 2013. A girl in the Friday protest against Al-Assad regime. Aleppo, Syria. 2013. Combats near the international airport of Aleppo, Syria. 2013. 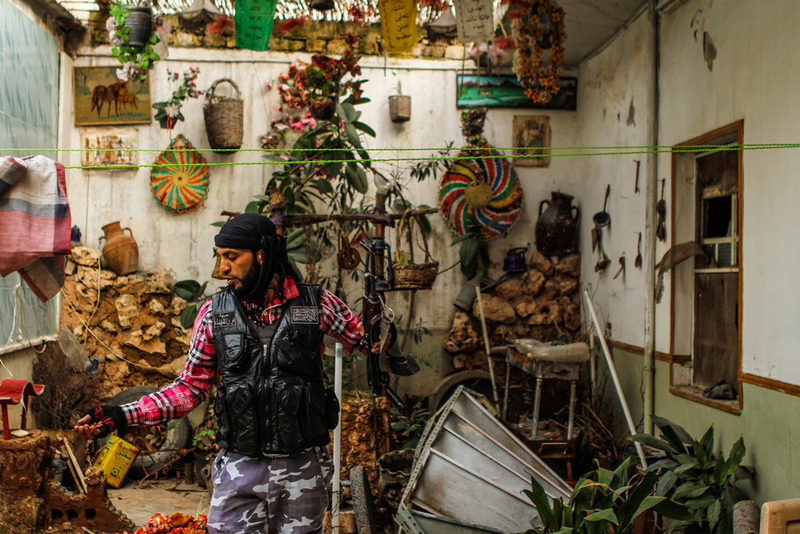 A rebel fighter inside a destroyed flat, now, part of the frontline of the Izaa district. Aleppo, Syria. 2013. Children play in the rubble of a destroyed building. Aleppo, Syria. 2013. A rebel fighter walks around a house near the frontline of the international airport of Aleppo, Syria. 2013. A young rebel fighter patrols a market in rebel-controlled Aleppo, after the end of the fasting in Ramadan. Markets are opened for a few hours so people can buy supplies for the breaking of the fast, the close quickly because of fear of the intense bombardment campaign of the regime forces in rebel controlled Aleppo. 2014. A man sits inside a destroyed building in Aleppo rebel held area. This year has seen an increment of the bombardment campaign of the regime forces in rebel-controlled Aleppo, Syria. 2014. A man walks with the Syrian football jersey in a street of rebel held Aleppo. After months of intense bombardment campaign of the regime forces in rebel controlled Aleppo, Syria. 2014.